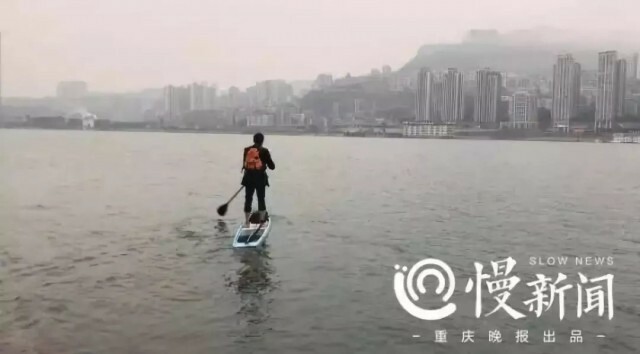 A video of a man using a paddle board to cross the Yangtze River as part of his regular commute in Chongqing has gone viral on Chinese social media. Given a lack of ferry service in the area, and rather than spending an hour on the roads getting from his home to his work on the other side of the river, Liu Fucao, decided a paddle board would be the best way to make the one-kilometer commute. Outfitted with a waterproof backpack for his belongings, including his briefcase, Liu Fucao has been using this method to cross the Yangtze River to his work in Chongqing since July, 2018. He says he uses his paddle board on most days, unless its raining, or if the river seems to be running too quickly. Liu Fucao says he picked up paddle boarding two years ago, and also competes in professional races.